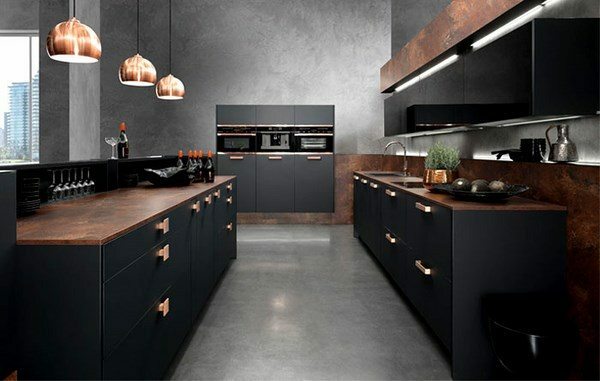 Black and copper kitchen ideas present amazingly beautiful designs which demonstrate how you can customize the interior and give it unique character and individuality. To many people black color, especially in the kitchen, is an extravagant choice. Others are afraid of this color as they think the kitchen will be dark and depressing. 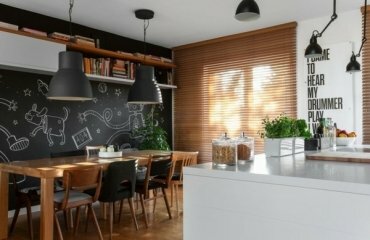 Some people think that their kitchen is too small or poorly lit to bear a dominating black color and being cautious not to make a mistake, people prefer to play safe which makes them opt for interiors in neutral and bright colors. Obviously, everyone has his own taste and there is no need to try and convince the world that your black kitchen is trendy and cool. 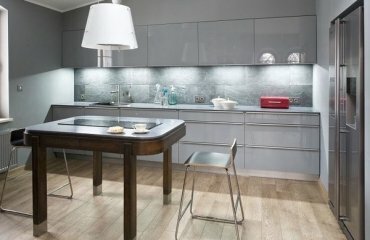 For those, who are interested in original, unique and creative interior designs, we will look at the techniques to have your modern dream kitchen and will show you some inspiring examples of fascinating interiors in black and copper. 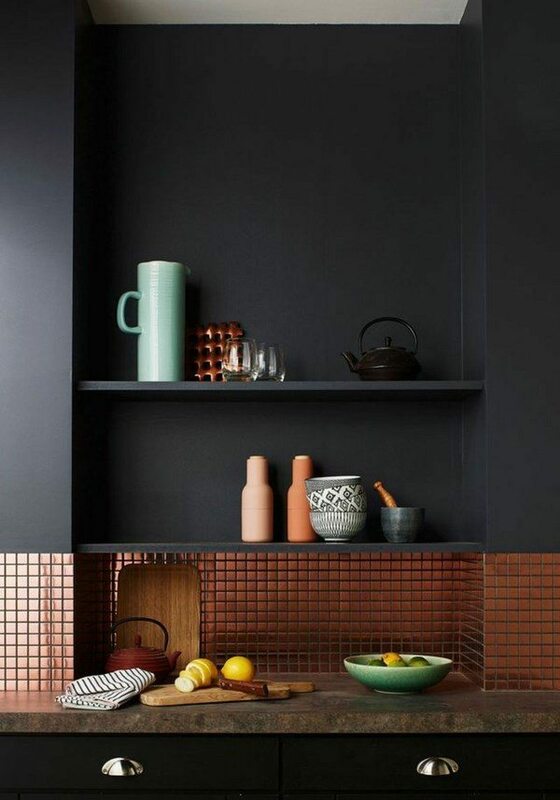 Black and copper kitchen ideas present an appealing combination with incredible eye catching accents, details and accessories. You may hear that black is not a color, but an absence of color. In terms of design, however, it is a strong and powerful statement when used properly. Looking at pictures of black kitchens one understands that they have a special atmosphere and can look as luxurious and exclusive as an expensive car. The hint of mysterious elegance and strict refinement make these interiors timeless and place them above fashion trends that come and go. 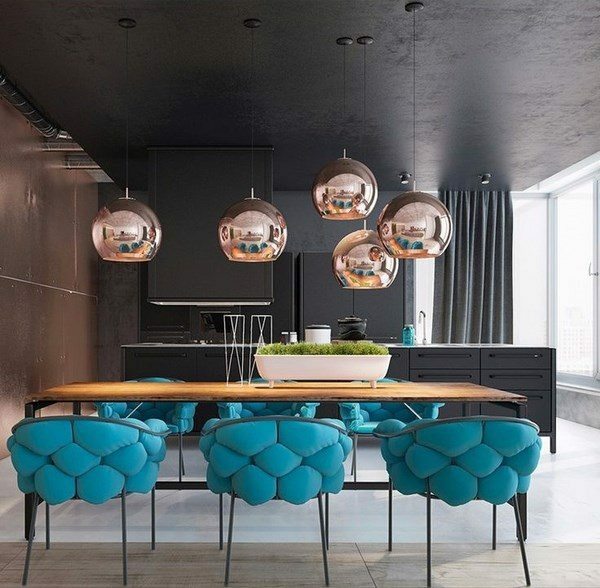 Even the most experienced designers take this color seriously and treat it with respect and attention balancing it with natural stone, glass, metal accessories and original lighting solutions. You will hardly see a rustic kitchen in black. 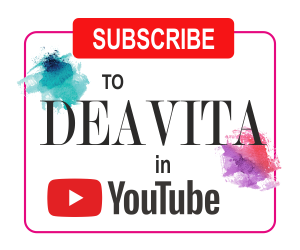 The color is much more suitable for minimalist, industrial, high-tech, avant-garde or art deco interior designs which feature laconic forms and clear, straight lines and lack of ornaments. To reveal the grandeur of the color you need to give it space and that is the main reason why we see it in lofts, open plan living spaces which unite kitchen, dining room and living room. 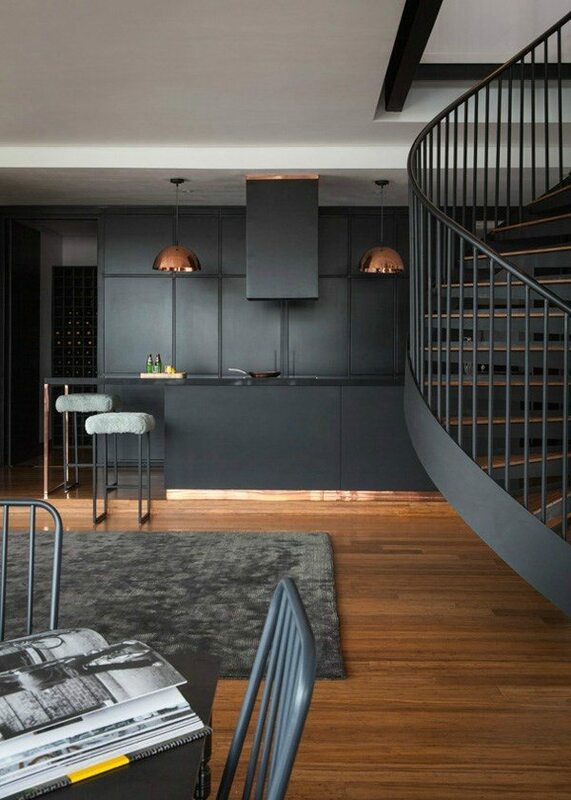 This does not mean that moderately sized areas can be designed in black but you just have to follow the rules and make the best of the design tricks and techniques. When it comes to metal decor in the interior, the first to come to mind are golden and silver appliances, accessories, lamps and accessories. Contemporary interiors feature stainless steel, chrome, but the truth is that metal is often neglected as a decorative tool. The shining cookware was a typical feature of every kitchen for hundreds of years. Modern times changed fashions and with the appearance of stainless steel, copper lost its popularity. Nowadays we see its return not only in pots and pans but as a decorative element in modern kitchen interiors and we enjoy the fact that copper is at the peak of popularity among designers around the world. The noble red metal elegantly complements the interiors and draws the eye and the attention to the details. 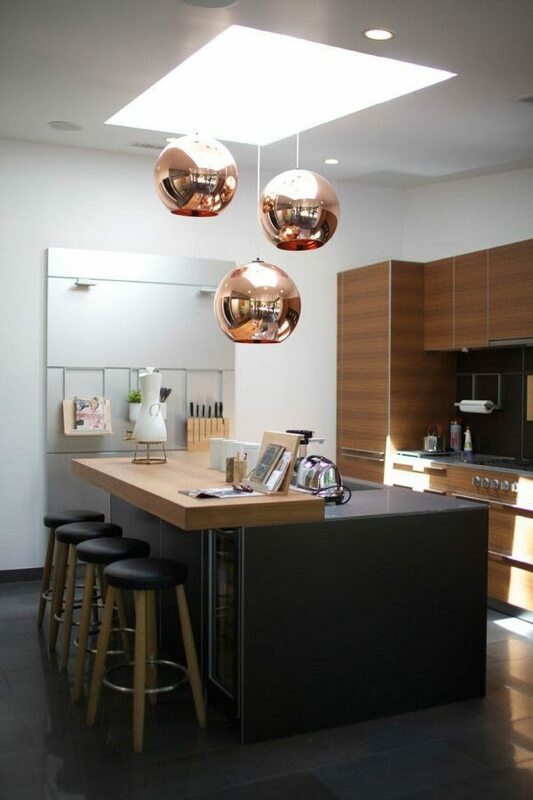 Black and copper kitchen ideas – extravagant or cool? 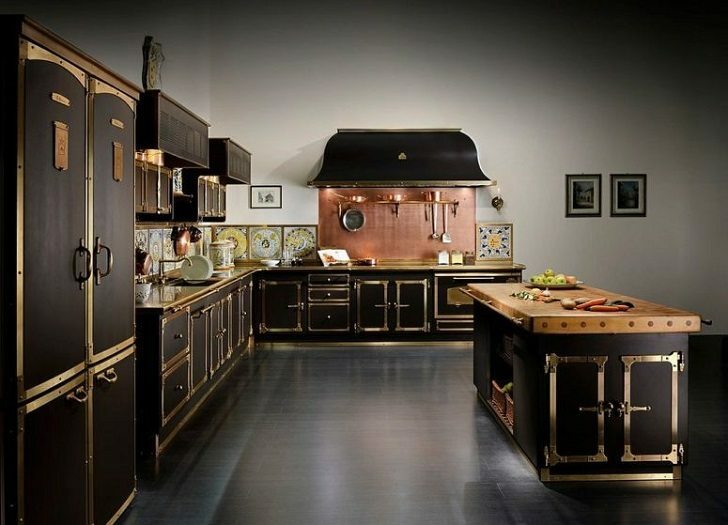 Despite the fact that the idea of having a black and copper kitchen seems extravagant you will see the images and realize that there is nothing extravagant or crossing the borders. On the contrary, the combination is tasteful, elegant and even exquisite. We said that black should be used with attention and expertise. When used in a chaotic manner and without a general concept that combines and unites the elements of interior design into a harmonious result, it is more likely to achieve a negative result. Black can visually reduce space and make furniture look heavier and bulkier. It looks messy if not properly cleaned as dust, crumbs and dirt are clearly noticeable. If you have the illusion that black kitchen furniture will disguise dirt and dust you shall be deeply disappointed. These kitchens look at their best when clean and organized so clutter is simply unacceptable! 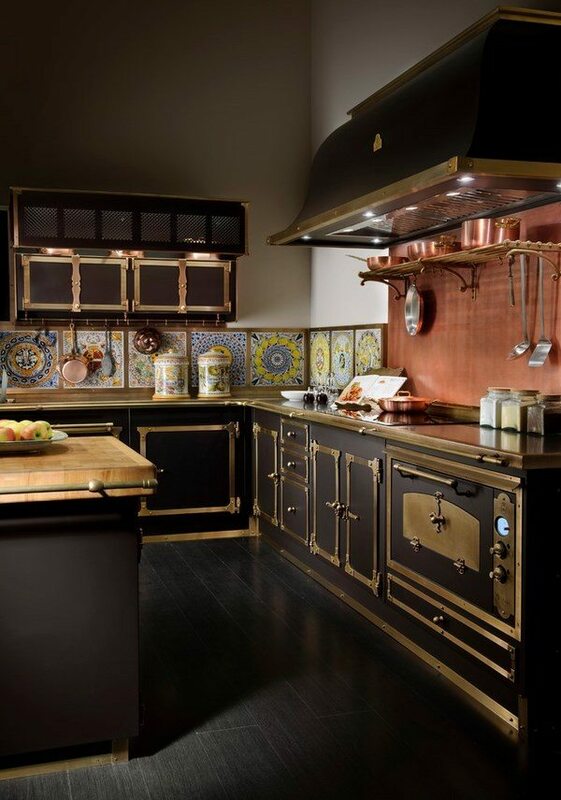 A kitchen in black and copper can be inviting, cozy and comfortable as well as sophisticated and elegant. The main task is to use the colors correctly and achieve harmony between color and form. Black does not mean dark! One major property of the color is that it can balance all other colors and at the same time, emphasizes them by creating a visual contrast. Due to the fact that it is neutral, it can be combined with any other color or be used as the perfect background for the noble copper shine. 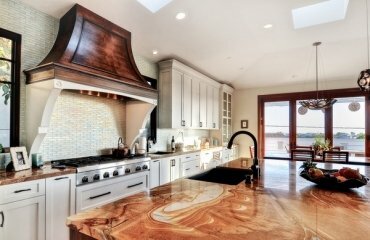 It makes the kitchen look live, warmer and friendlier. It is not recommended to opt for a monochrome black interior. 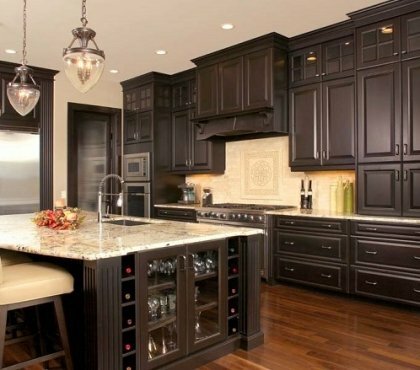 Dark colors may dominate, if you have a large and well-lit kitchen. 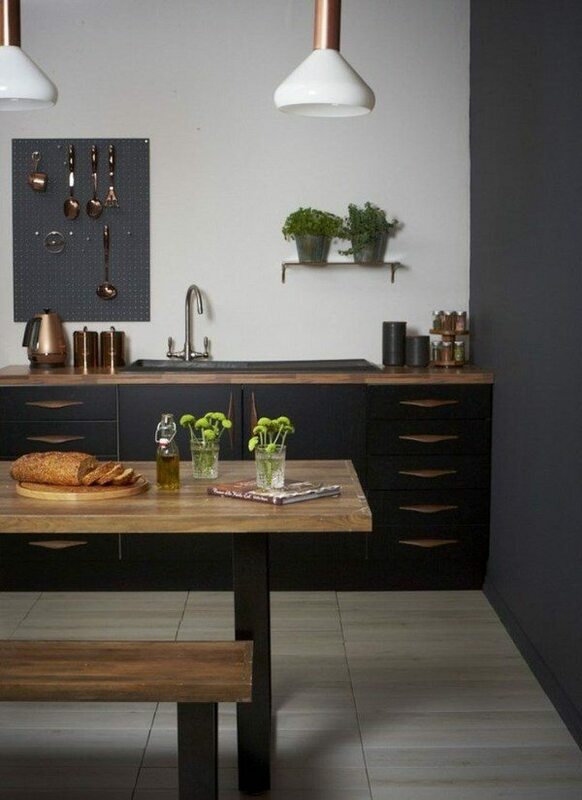 Use black with extra caution when you design a small kitchen. The lack of natural light can be compensated with creative artificial lighting. Add a complementary color in a lighter shade to balance the dominant black – gray is a good choice and can be used as wall color, floor tile or backsplash. Black and gray work very well with copper elements as well. 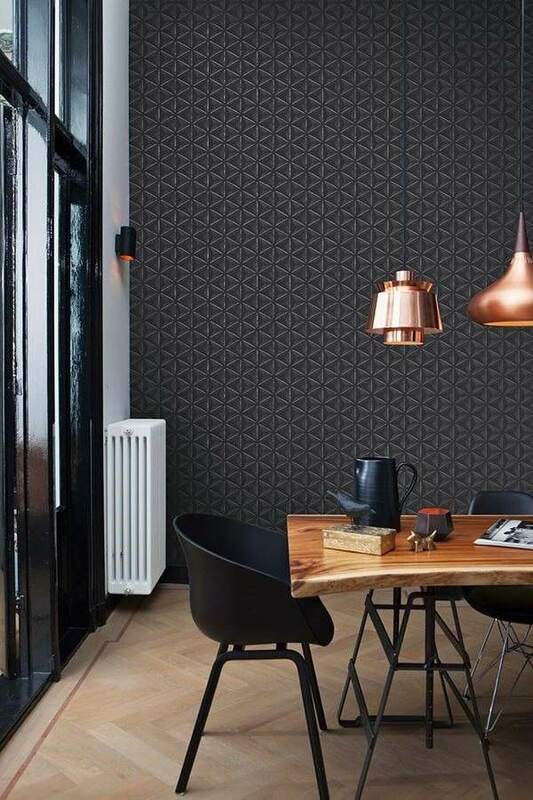 Think about textures – depending on the texture black color has a different appearance. 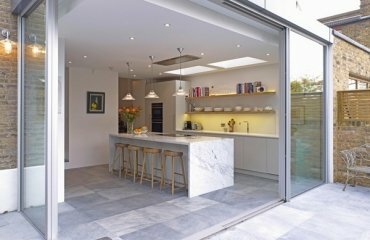 Matte surfaces look great and elegant while gloss finishes give a modern feel to the interior as the cabinets’ surface reflects light and creates beautiful glare. 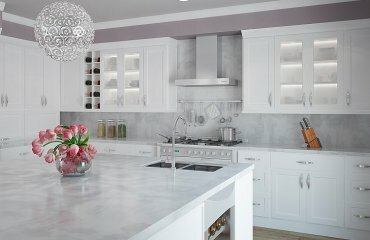 The style of the kitchen cabinets will depend on the style of the interior. In case you are not sure that all-black-cabinets are a good choice, it will be a good idea to opt for upper cabinets with glass doors. 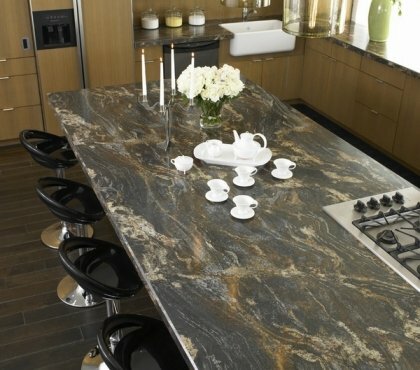 Choosing a countertop for a black and copper kitchen interior will also depend on the design concept and your personal taste. 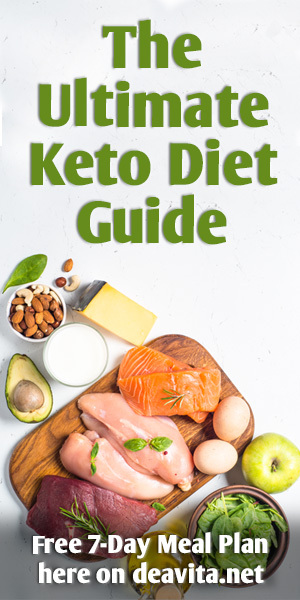 You can choose gray or white granite countertops which will create a visual contrast and a balance in the color palette, solid wood countertops will add warmth to the interior and an extra touch of beauty coming from the wood grain. Polished concrete countertop is also an option which is a good choice for minimalist styled interiors. Of course, last but not least, is a copper countertop which will add a dramatic and spectacular feature to the kitchen design. Consider proper accents and accessories – porcelain, glass, fresh flowers – these are an excellent way to add a fresh touch in a black kitchen. 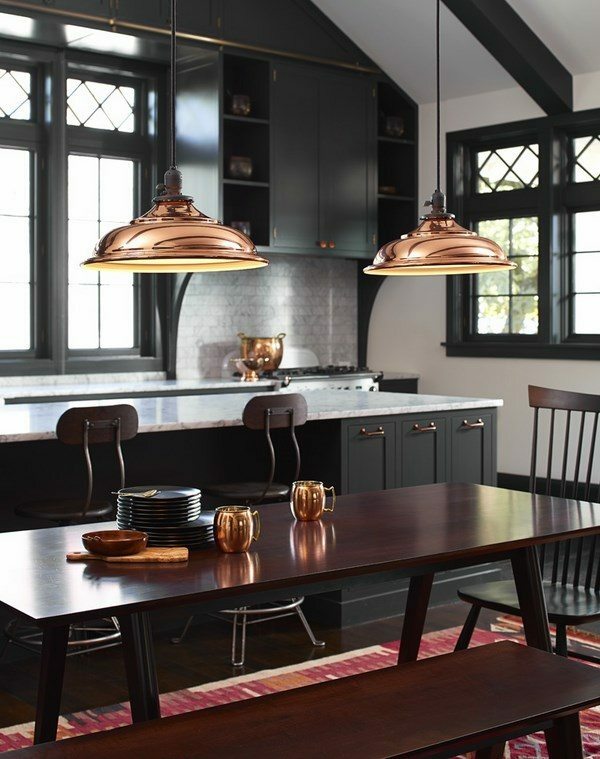 Proper lighting is essential for black and copper kitchens and has an important role. It will be perfect if the kitchen has a panoramic window or skylights. Curtains, if any, should be transparent so that they will diffuse and not block natural light. Artificial light is equally important – ceiling lights, accent and decorative lighting should be combined in a way which showcases the interior and enhances its elegance. Oversized chandeliers or a group of pendant light fixtures, a luxurious crystal chandelier – there are many options, but the main thing is to provide sufficient lighting. 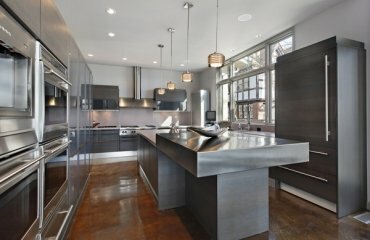 How to use copper in a black kitchen? 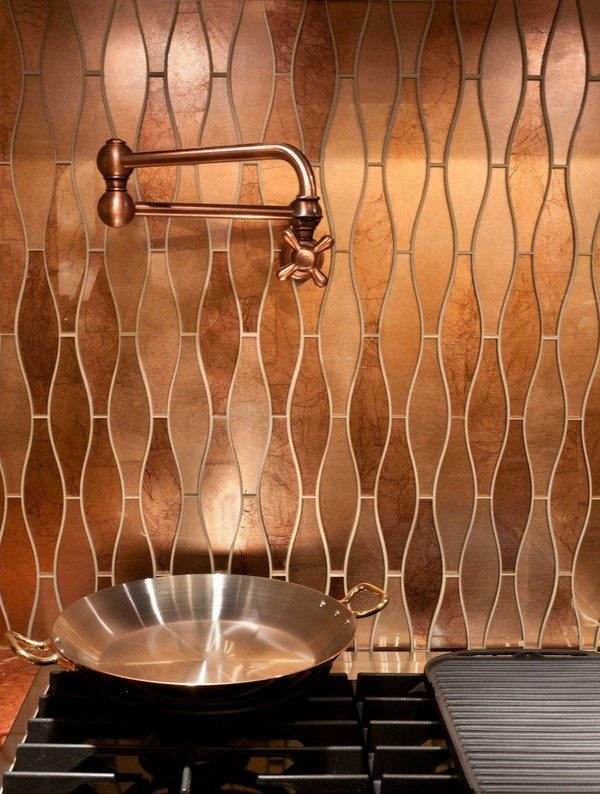 Introducing copper as a decorative element in a black kitchen can be done in many different ways. Of course, this will depend on the overall design concept and the personal taste of the homeowner. Copper offers a variety of warm shades from bright red to almost brown and you can choose from different surface finishes. Copper countertops, hoods and sinks are spectacular elements in any kitchen design, but look absolutely gorgeous in a black kitchen. In addition, it is durable, reliable, with excellent anti-bacterial properties. 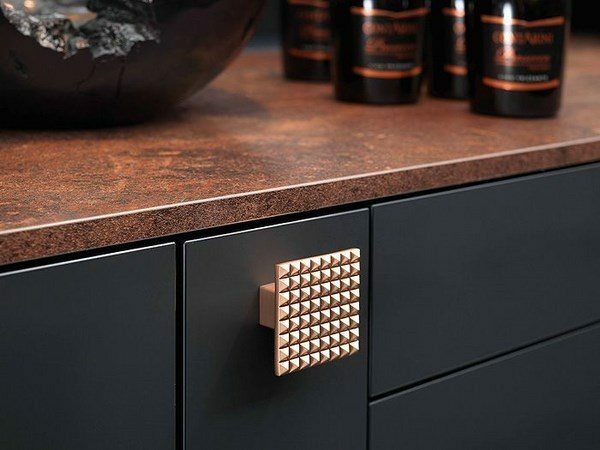 Copper hardware for kitchen cabinets is another way to add accents and make the furniture look modern and stylish. 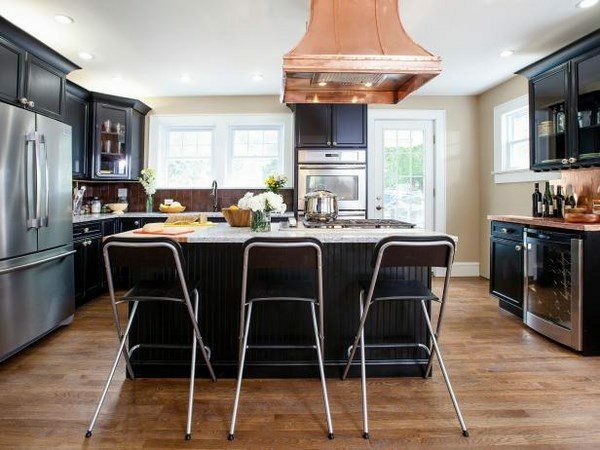 Copper chandeliers, pendant lighting fixtures or sconces add to the luxurious appearance of the kitchen and are a great way to add copper accents in a black kitchen. Copper cookware and appliances will give you an opportunity not only to cook like a professional chef but will be beautiful items to display on your countertop. The warmth of copper is just a touch of rustic style into a contemporary kitchen which will make it look comfortable and inviting. 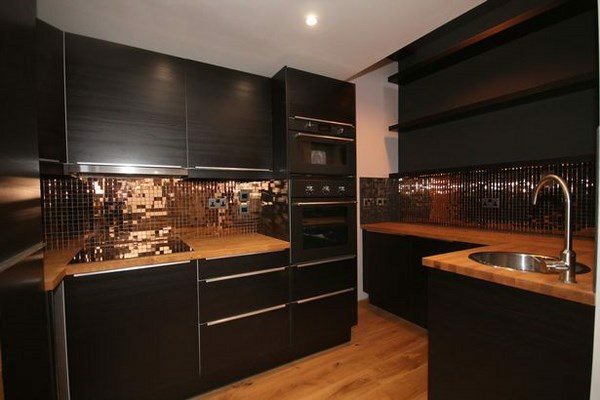 Look at the pictures and ask yourself are you bold enough for a black and copper kitchen interior? 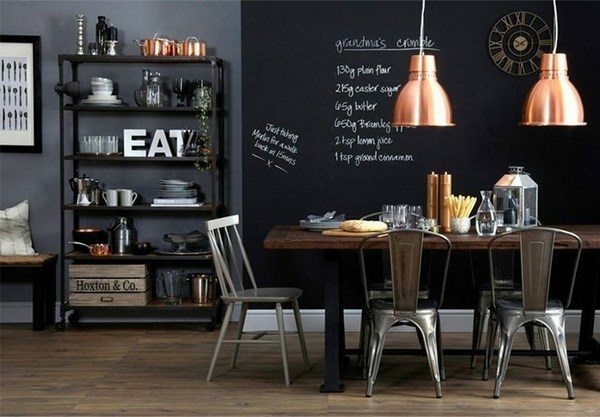 Kitchen chalkboard ideas – creative decoration or a practical idea?